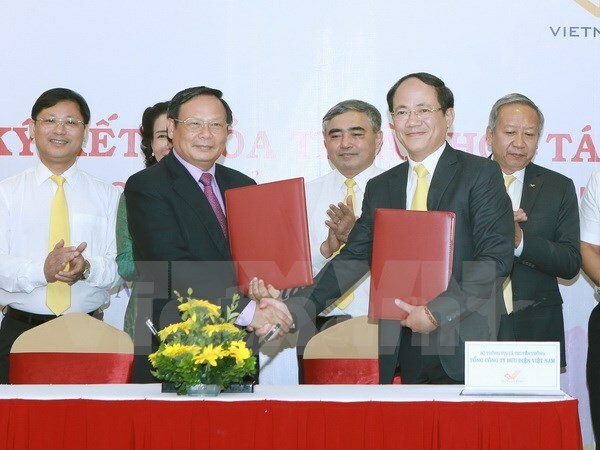 Hanoi (VNA) – The Vietnam National Administration of Tourism (VNAT) of the Ministry of Culture, Sports and Tourism and the Vietnam Post Office Corporation (VNPost) of the Ministry of Information and Communications signed a cooperation agreement in Hanoi on August 4 to promote Vietnam’s tourism at home and abroad. Accordingly, Vietnam’s tourism will be promoted via products and services such as stamps, postcards, envelopes and calendars. The VNPost will assist VNAT in surveying tourism markets while providing post services, receiving and transferring the results of administrative procedure settlement to VNAT, relevant departments and travel agents. Speaking at the event, VNAT Director General Nguyen Van Tuan said VNAT will order 1,000 stamps as souvenirs to visitors, and the two sides will choose 1,000 – 1,500 out of over 10,000 post offices nationwide to distribute free tourism promotion information to domestic and foreign tourists. VNAT will also encourage foreign travel operators to add post offices with attractive landscapes and architecture into tour destinations, making it easier for tourism marketing. Last year, Vietnam greeted over 10 million foreign visitors, up 26 percent from 2015 and doubling 2010’s figure, earning 417 trillion VND (18.13 billion USD).